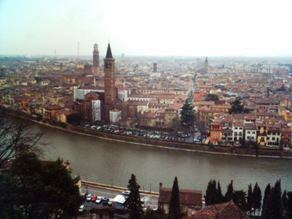 Verona was probably the ‘most Italian’ place I lived in, at least according to the archetypal image most people have of the place, that faint whiff of coffee drifting through the air as a Verdi opera sounds in the background. Yes, that’s about it. Always something happening, always lots to do. It helps to have a big pile of cash but that seems to go for most places I’ve lived in. 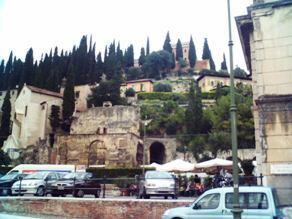 Verona is a major tourist attraction offering enough variety for most tourists to fill a week with. The main draws are the Roman amphitheatre and theatre, Juliet’s house and a few of the pretty town squares. There are also a few attractions just outside the town, although as I write I can’t think what one or two of them are called. I made sure to visit all the main attractions but doing that tourist thing could never be, so I didn’t go to many of them more than once but depending on the order you’re reading the site in, you probably think I’ve already made my point about not living as an ex-pat, so I’ll press on. ... the thing I took from Verona was such a detailed memory of the place, in spite of my having forgotten a lot of it since. Nowhere else have I lived have I got to know so well, and I have my bike to thank for this. Essentially, I spent most of my free time riding it, either up hills, see The Hill page on the menu bar above, up other hills, alongside the river or round the town. I must have gone down every street, scarcely a cobble unpedalled. 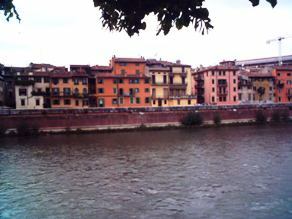 Verona was a great place to live although to be honest I have no desire to go back there. I am proud to have been Veronese for this relatively short spell and feel I could be a more than useful guide to the town not just to tourists but to people settling in to a new life. 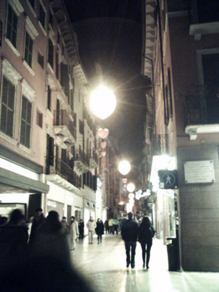 Let’s consider some of the things which people appreciate about the city, not including its obvious history and culture. First up, it looks so nice. Check these photos, and the extra page, what more could you want? 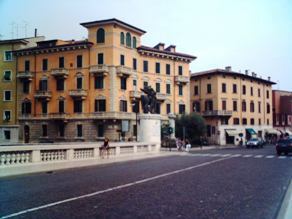 This is Italy, one of its nicest cities and still in pretty good nick. They keep it very clean too, when Italy won the World Cup we partied into the night but at about 3:00 in the morning they were sweeping the square and by 4:00 it was pristine again. There’s a little graffitti but all in all the buildings are in good condition and kept clean, unlike a few Italian cities where they are falling somewhat into disrepair. Secondly, there’s a lot to do in such a small area, from cinemas and night life to sports, and the very regular events they have in the town squares. The markets are busy and tasteful, the events varied and interesting. 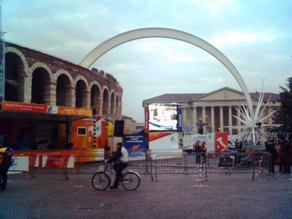 During my time there there were fairs, the Olympic torch passed through, there was the opera season in the Arena, there were exhibitions from all parts of Italy, there was the carnival, the cycle races, the marathon etc. Every week on our doorstep we could see and do something new. Just outside the city is one of the prettiest areas in Italy, the Valpolicella with its acres of vineyards and rolling hills. There’s the Adige, Italy’s second river and very beautiful for most of its course. I rode much of it, when not riding up some of the hills there. 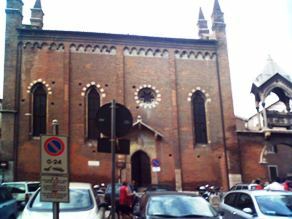 There are also a number of major towns within an hour or two, including Venice and Padova, Vicenza and even Bologna is relatively nearby. Lake Garda is an hour away, and the coast about the same in the other direction. Northwards stand the Dolomites, and past the city of Trento you’ll get to the German speaking area of the Sud Tirol, and the towns of Bolzano and Bressanone which are more Austrian than Italian. Eating out in Verona is easy, relatively affordable and people of any taste could probably eat in a different place every day of the year. Shopping is OK, doable, and there is a wide choice either in the towns or in the out of town shopping centres. As I said, there’s market of some kind almost every day, well worth going to. In summer they have three day markets in the square, typical products from all parts of the country, mainly meat in some cases but not entirely, I bought some spicy hot red stuff once, it was painful to eat. 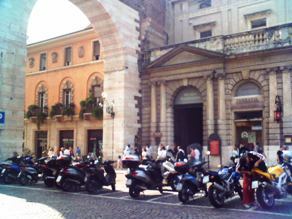 Not to pay for though, Verona’s not cheap but not Almaty either, teachers can get by and have a bit of fun too. As we did, and in such a nice place to boot.